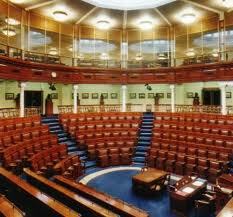 This area of the site is concerned with Dáil Business and my role as a legislator. The Dáil routinely sits on a 3 day per week basis, leaving the other 4 days open for work to be done in the constituency, on researching legislation and local and national issues that should be tackled at a national level. Until the abolition of the Dual Mandate that allowed TDs to serve as County Councillors simultaneously the vast majority of TDs would have held both offices and therefore the system was designed to accommodate that. County Council meetings traditionally occurr on Mondays and Fridays while the Dáil traditionally sits on Tuesday, Wednesday and Thursdays. Since 2003 however, once elected to the Dáil those who have served as County Councillors must give up their seat and make it available to a nominee to be co-opted in their place. This means that TDs no longer have the same commitments on Mondays and Fridays. I personally use this time to conduct research, to meet with groups and constituents on both local and national issues and to prepare for the sitting week ahead. I also work on strategic issues that require longterm planning, analysis and research during this time. Click here for posts under the heading of In the Dáil, alternatively you can visit Parliamentary Questions, Dáil Debates, Committee Business or Dáil Technical Group for topics that fall under those headings.